When LO began to walk I was so excited to take him to buy him his first 'proper' pair of shoes. They were a little navy blue pair of soft soled shoes with aeroplanes on, perfect for him to practise his new found skill of cruising around the furniture and taking his first steps unaided. It feels like a lifetime ago but in reality he has only been walking about 18 months. What I didn't realise at the time was the sheer number of pairs of shoes he would get through in such a short space of time. 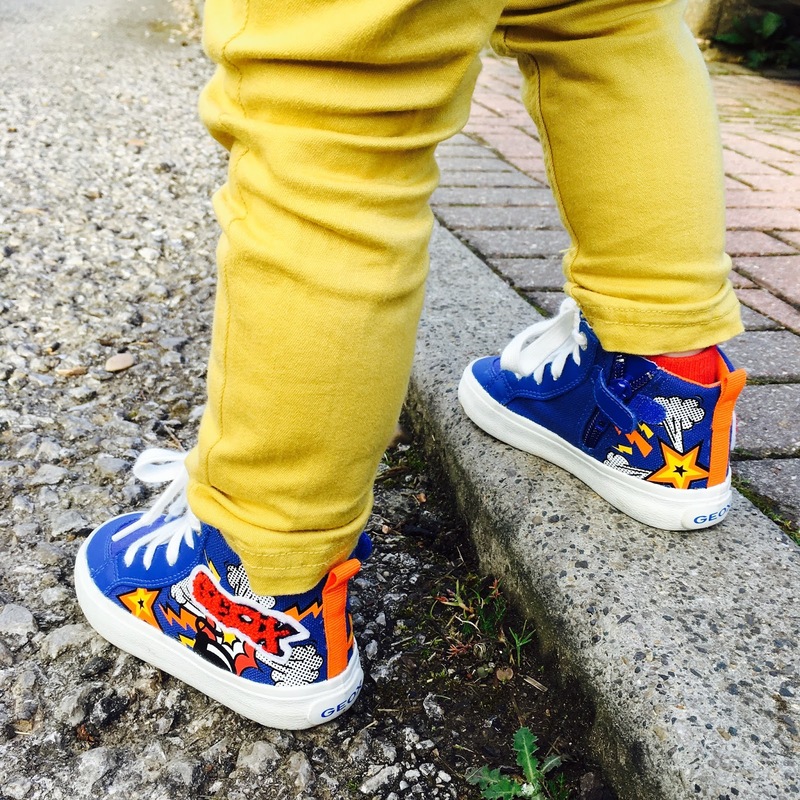 Children's feet grow incredibly quickly and with toddlers being as active as they are, it really is important that they have a good pair of well fitting shoes. Bar his wellies, I only ever really have one pair of shoes for LO at a time- I don't get him lots to match different outfits as I know how quickly he will grow out of them. Instead, I tend to spend a little bit more and go and find the perfect pair for his feet in a nice design which I know will suit a lot of his outfits. He's had his current pair of little high-tops for a while now so I was really pleased when a local family run shoe shop called Poppy Red got in touch to ask if we would like to go along to have a look at their shop and find the perfect pair of shoes for LO. I was really pleased that we were able to experience a family run business, and being based in Ilkley, West Yorkshire, they are also a local business to us. Supporting local family run businesses is something which I am hugely passionate about. The shop itself is in the beautiful town of Ilkley and located in the Moors Shopping Centre, just off the main car park in town. Along with getting their hair cut, taking children to get their shoes fitted is one of those experiences which can sometimes be a little nerve wracking- wondering if they are going to kick off and have a tantrum or refuse to get their feet measured when you are in a busy high street shop with queues of people waiting their turn. But on entering Poppy Red, our experience couldn't have been further from this- it was lovely and calm, beautifully tidy and the co-owner Jenny gave us a warm and friendly welcome. LO even went over to her, said hello and shook her hand in a very gentlemanly fashion. 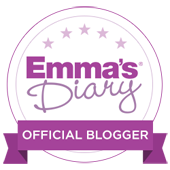 Our whole experience from start to finish was a pure delight and has made me realise that as a parent you shouldn't feel pressure to automatically stick to going to one of the well known high street giants for shoes. 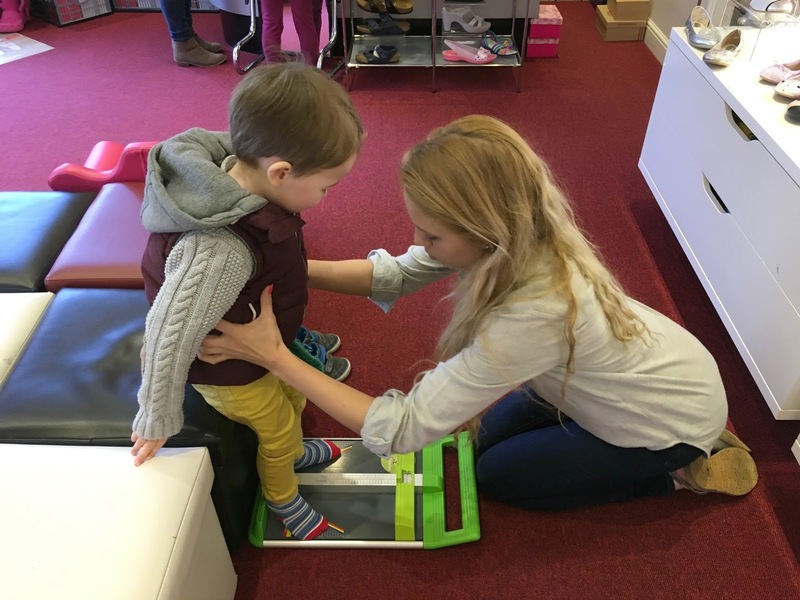 The service felt very personalised and Jenny, who has a specialist qualification in shoe fitting, began by carefully measuring LO's feet and looking at the shape of them- the width, in-step and length. She then asked us if there was any particular style we were looking for. 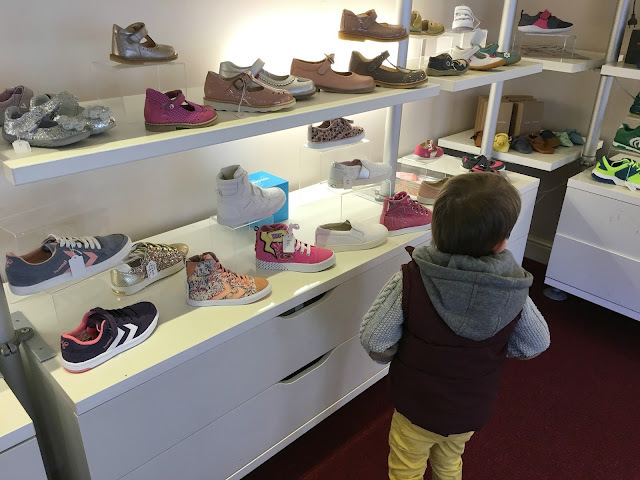 LO is an active toddler and walks everywhere, and seems to enjoy wearing hi-tops, so we asked to see the range. I was expecting her to present me with maybe two styles, but she came back with a huge array for us to look at. It was great to have such a choice of styles. She took great care to try different styles on his feet and with her in-depth knowledge was able to advise which were best for the shape of his feet. 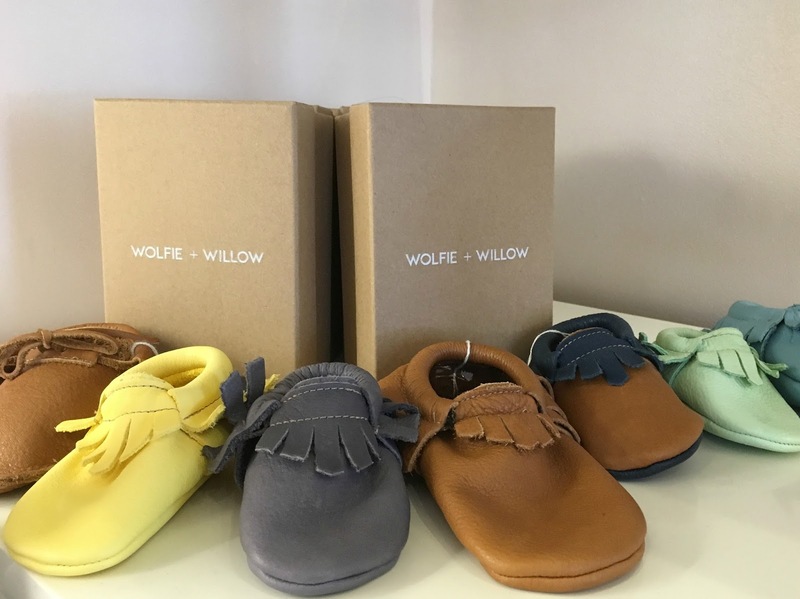 It was hard to choose with so many amazing brands and styles on offer- so many more than where we have previously been to get our shoes from including Bobux, Kickers, Birkenstock, Lelli Kelly, Geox, Young Soles and Wolfie and Willow. In the end we opted for a lovely pair of bright blue high tops with cartoon detailing by Geox costing £48. As soon as we saw them, LO loved them and I thought they were just so "him". 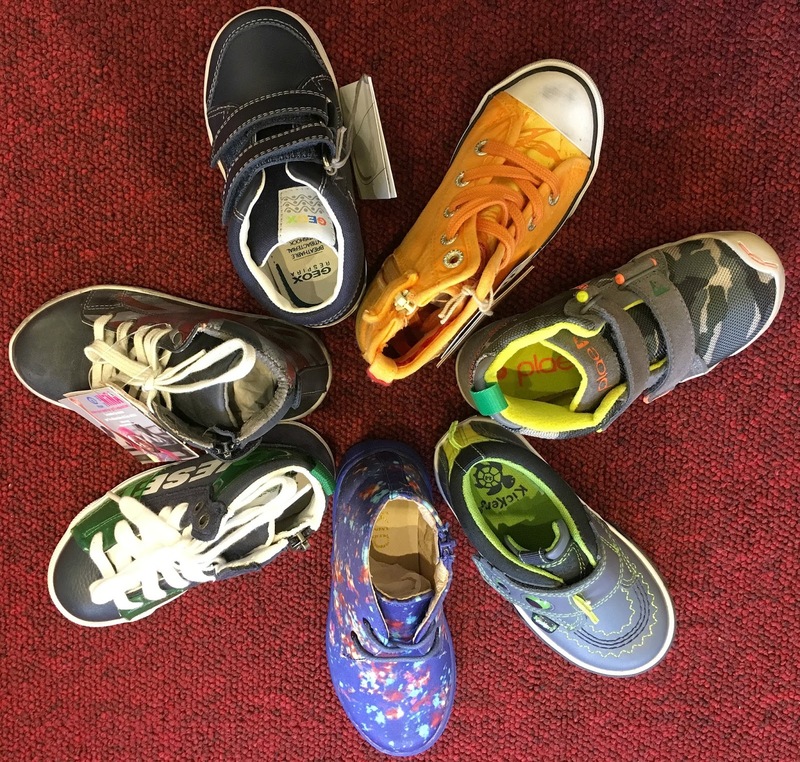 The shop specifically specialise in children's shoes (ladies shoes available on the website) they are able to provide a really wide range of shoes in all sorts of brands, colours and styles. While LO was getting his new shoes on I was admiring some gorgeous pairs of sparkly girls shoes which I totally would buy for myself if I didn't have such big feet! In addition to standard children's shoes, the shop also do specialist fitting of babies feet too. With Little L in mind, I thought I'd also have a quick look at some of their first shoes for babies learning to crawl and walk- they have a great range of soft soled flexible shoes by brands such as Wolfie and Willow and Bobux. Aside from the fantastic shoes fitting service and huge choice of shoes, the thing I was most impressed with was the service. 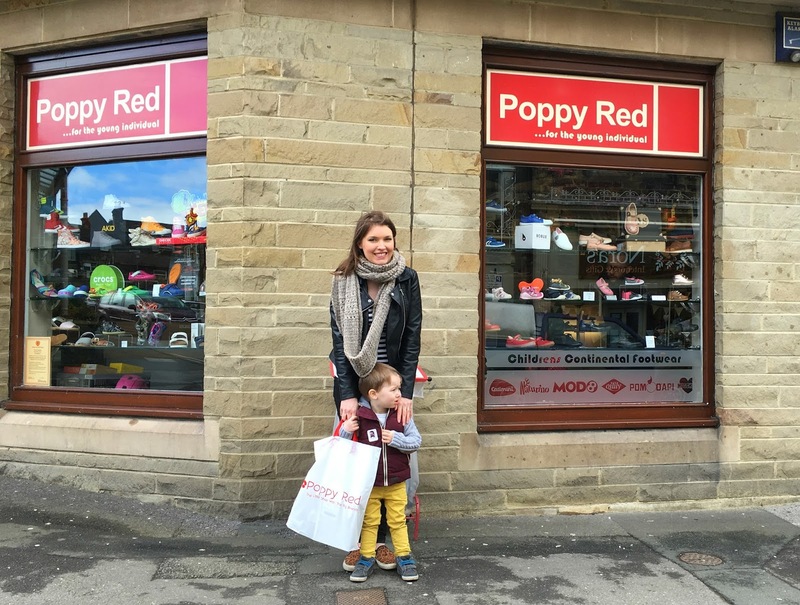 In this day and age, customer service has really taken a nose dive in some shops, but at Poppy Red, we felt like valued customers and we really appreciated having such a personalised and friendly service. LO really took a shine to the co-owner Jenny and she was fantastic with him too. I've mentioned previously on my blog that foot problems run in my family, and so getting my children a decent pair of shoes which fit well is a real priority for me. And I am even more happy to make that investment knowing that I am getting a friendly, personalised service whilst also supporting a local, family run business. Thank you to owners Helen and Jenny for inviting us to Poppy Red. We thoroughly enjoyed our visit and LO absolutely loves his new shoes. I am hugely passionate about supporting local businesses and if you would like to feature as part of my new local business series, please feel free to get in touch with me via the contact me section on my blog. NB: We were very kindly given a £40 voucher towards the cost of a pair of shoes of our choice. All photos, words and opinions expressed are entirely my own.